In a few years, the exploitation of shale gas has revolutionized the energy sector in the United States and North America. It now promises to do the same over the rest of the planet. However, while the resource appears to be plentiful all around the globe, its exploitation is far from being welcome everywhere. What do we really know about the risks and benefits of this new energy source? Why are Americans developing the resource at a rate never seen previously in history while elsewhere local population offer a strong resistance? 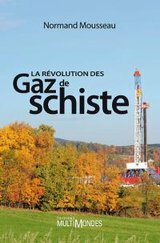 The shale gas revolution (in French) is the first book to look directly at this issue, examining the scientifiques, environmental, social and economic aspects of this new resource that is revolutionize our view of fossil energy. La révolution des gaz de schiste was published in the Fall 2010 at Éditions MultiMondes. It can be ordered in paper or electronic format here: Éditions MultiMondes. La révolution des gaz de schistes was one of the final contenders for the 2011 Roberval Award for popularization of science. This prize has been awarded for more than 25 year to recognize the excellence of works aiming at the popularization and communication of science in four categories: public books, academic books, TV documentaries and multimedia productions. In 2011, 20 finalists were retained, in four categories, out of more than 400 submitted works.